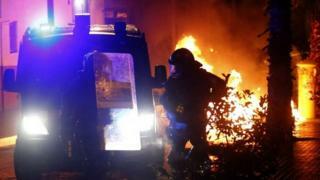 Police in the Spanish city of Barcelona have clashed with gangs of hooded youths in the third night of violence triggered by moves to demolish a well-known squat. At least 25 people were arrested overnight on Wednesday when police were confronted by about 2,000 protesters. The demonstrators pelted them with bottles and stones. On Monday squatters were ejected from Can Vies, a public building occupied for 17 years by left-wing radicals. Those arrested are accused of a variety of public order offences. A police spokeswoman told the AFP news agency that helmeted police charged protesters after they breached a security line. The rioters responded by tipping over rubbish bins, breaking windows and pelting them with missiles. Police and city officials say that the protesters used similar tactics on previous nights, in addition to attacking banks and charging police vans. The Can Vies building is located in Sants, a working-class neighbourhood owned by Barcelona's transport authority. It was occupied in 1997 by activists who used it to hold concerts, training courses and other events. The transport authority wants to demolish it and redevelop the area. Police acted on a court order to clear the building, which was issued after talks between the squatters and the authority broke down.